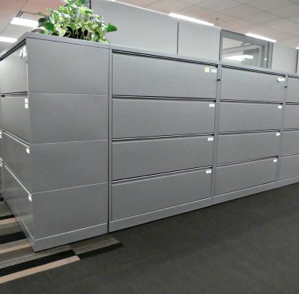 These offer personal storage, team storage, meeting point solutions and lockers. They can be also used as space dividers that structure workspaces. These extend the workspace by offering storage near the workstation. It can be used as a space divider, structuring personal and team workspaces. These are a complete storage family of mediumto-high capacity metal cupboards. It is a robust work tool. It can be combined with functional and ergonomic internal fittings. These offer high flexibility for all environments. They can be used as individual or team storage. Most have fast entry to lock and unlock it.